Moonrise Kingdom is as exciting a movie one can imagine that isn’t really billed as such. As typical of director Wes Anderson, everything’s perfect (or maybe “unreal” is the right word) from an aesthetic standpoint. Here, camera shots are precise, dialogue is said without a second thought, exterior scenes are shot with a sepia tinge, and a storm at the end over a near-Nolan blue. But under this, there is a well assembled and admirable movie. It’s become lazy to resort to the word “quirky” when referring to the contents of Anderson’s filmography, but it’s sort of obvious. Most of the film transpires over three days in September 1965. Sam (JARED GILMAN) is 12 years old and a member of the “Khaki Scouts”, Troop 55. Scout Master Ward (EDWARD NORTON) notices that Sam’s tent is empty one day, and a massive search goes out for him. Where is he? Well, to explain this, we flash back a year and find out about him meeting Suzy (KARA HAYWARD). Through letter correspondence, they realize that the other considers themselves an outcast and concoct a somewhat elaborate scheme to run away together. Anderson’s script (co-written with Roman Coppola) is intriguing. Each character is fascinating, regardless of their prominence in the film. I was especially interested in Bill Murray will faithfully appear in Anderson’s films does so here. (He plays Suzy’s father). Jason Schwartzman, whose career arguably started due to his involvement in Anderson films, has a small but significant role towards the end. It’s probably wise not to go into a Wes Anderson film not expecting realism – a hyper-realism-esque deadpan may be a more appropriate descriptor. Open emotion is restricted to a minimum. It is a factor in the background of scenes, and the construction of dialogue, but it is intentionally not overtly displayed as part of the overall output of the scene itself. 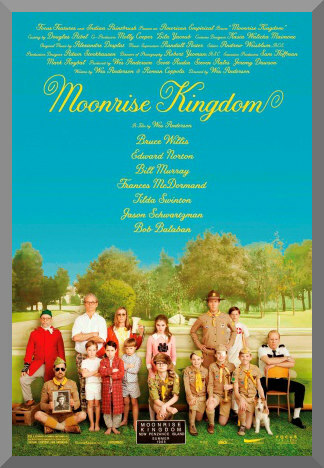 Music is a recurring theme in Moonrise Kingdom – the film starts and ends with a 45 rpm containing a voice dissecting an orchestra, and this continues with Alexandre Desplat’s score over the end credits. This almost provides a strange contrast with the mood of the movie itself – music, by nature, is based on an outpouring of emotion. This is a well done film, no question about it. While it has no lasting impact as anything especially great on me, this is not because of the existence of big, gaping flaws, but just by the fact it doesn’t stand out from other three star movies in terms of overall memorability. That’s not to say that it isn’t different, though. Moonrise Kingdom is very different than most any other movie I’ve reviewed this year. I was excited when I had the chance to look at a Wes Anderson film, as I had heard so much about his movies and his career in general. Now that I have, my conclusion is basically what I hoped for going in – clearly styled, well and uniquely written, acted as mandated, and a recommendable feature.